In 1997, the death took place in Lahinch, Co. Clare of Jack Shine – a true legend in the sport of sea angling. He is sadly missed by his family and friends. Jack was a gentle man and must have been the most innovative sea angler this country has ever seen. In the early 1930’s, Dr. O’Donel Brown took numerous porbeagle to 365 lbs from a small boat off Achill – a great achievement for his day. However, Jack decided to go a step further. He set out to land porbeagle from the shore. In the early 1950’s, when jack, a Corkman, arrived as creamery manager to Moy near Lahinch, he enthusiastically joined the local anglers who fished from the rocky ledges at Black Head, Ballyreen and at Green Island on the south western tip of Liscannor Bay. Traditionally, mackerel and pollack were fished for the pot. They were caught on a rod which most of today’s anglers will never have heard of, and few will have seen. It was called a “Wattle”. Down near Milltown Malbay at the foot of Mount Callan, was a bamboo grove. An annual pilgrimage to the grove yielded poles up to 15 ft. long. To the tip of the pole or wattle was attached 15 to 20 ft. of line, and the business end was a red and silver mackerel spinner on a length of gut, or a few home-made mackerel feather lures. The lures were normally made of feathers plucked from a white leghorn chicken or else goat’s hair. The goat’s white “smiggle” was always considered supreme. A rubber eel was used for pollack. Gradually through the 50’s, the equipment improved. Fixed spool reels appeared loaded with monofilament line and a variety of rods made of split cane, greenheart and finally the new wonder material, fibreglass. Jack revelled in this new technology. He was also the envy of many as he had a motorbike and could travel to places like Ballyreen and Black Head, where he was continually probing and experimenting with casting techniques and catching methods. By the early 60’s, many well equipped anglers were fishing the ledges. Some could cast a string of feathers as much as 70 or 80 yards! This is short by today’s standards but at that time, this was quite an achievement. Quite often, there was chaos on the rocks when, to the annoyance of everyone, a shark grabbed at either the feathers or a live mackerel being reeled in. Of course, it made smithereens of the gear and usually disappeared with the valuable string of feathers, much to the chagrin of the angler. These marauders were eventually identified as porbeagle shark which were feeding on shoals of mackerel close in to the rocks. After experiencing many such burst ups, jack made up his mind and announced, to the amusement of his fellow anglers, his intention to hook and land a fish of 100 lbs or over from the rocks – a feat never before heard of in Europe. In early 1962, he started the assault from the rocks at Green Island. His tackle was an 8 ft. solid glass rod, a Luxor fixed spool reel with over 400 yards of 19 lbs B.S. line and a short 7 ft. wire trace. Local anglers were using this equipment for ordinary shore fishing so many a wry comment was passed as Jack persisted in casting out the tail half of a mackerel about 60 yards and retrieving it slowly. The good humoured banter increased as jack continued for 2 months without even the smell of a shark. But the smiles disappeared when he landed a porbeagle of 77 lbs. There was further consternation towards the end of August the same year. He took two in one day – 75 lbs and 91 lbs. Things were looking up. 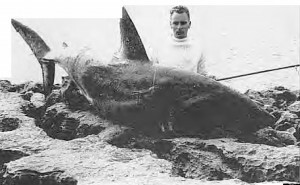 In May, 1963, after a hectic 45 minute battle during which the shark stripped off almost a quarter of a mile of the 19 lbs line, he lost a fish of about 120 lbs at the bottom of the rocks. Jack was now certain that the challenge was achievable but the tackle needed upgrading. He got a 12 ft. fibreglass beachcaster (test curve 6 lbs) and a 61/2 inch Alvev side cast reel of Australian origin with a star drag which acted as a braking system. The reel had two spools – one held 400 yards of 31 lbs B.S. monofilament and the other 400 yards of 60 lbs. This allowed him to cast the bait 75 yards and the reel capacity allowed him to fight the shark at a distance rather than close to the inshore reefs and jagged rocks. He made up 12 ft. long gaffs from graded sewer sticks. He was now ready for that 100 pounder which he knew he could handle. In 1963, four of the porbeagle he landed were over 100 lbs including beauties of 130 and 138 lbs. Each year after that, he took 100 lbs plus porbeagle from the shore and he did so in several locations including Ballyreen. 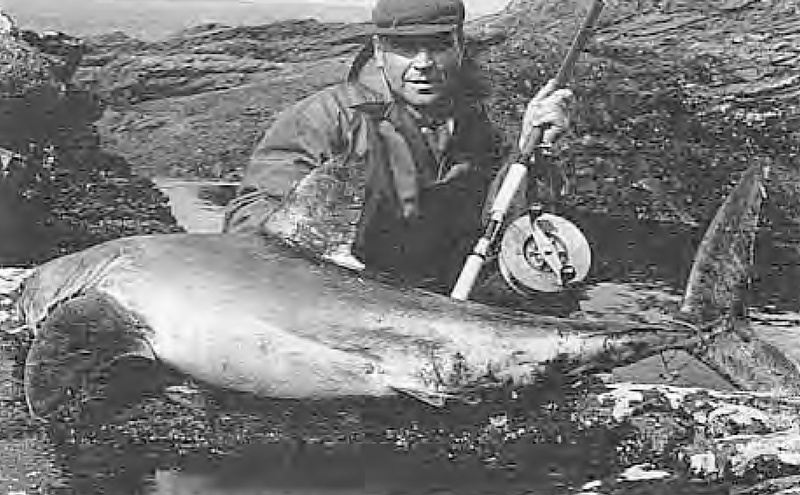 Jack Shine’s largest from the rocks, a porbeagle of 145lbs. taken at Green Island. Note the Alvey sidecast reel. 1967 proved to be a particularly interesting year. Through June and July, Jack was using the 31 lbs line on the Alvey and he landed shark of 140 and 145 lbs without any great difficulty, turning them in about 250 yards. He had an idea that there were bigger fish about in August, so he replaced the 31 lbs gear with the 60 lbs. I was with Jack at Green Island that day in August when we actually saw a huge shark take the bait and move slowly out to sea. As was his practice, Jack allowed the shark plenty of time before striking but when he did, nothing registered with the shark – it kept moving slowly out to sea. At 200 yards, Jack decided to turn the shark so he applied pressure – but to no avail. This shark was not for turning. At 300 yards, the reel’s drag was up to its maximum and jack had to brace his feet against the rocks. The fish just kept going slowly in the same direction. At 375 yards, he called his son Gerrard to help him hold the spool to prevent it turning. But the end of the line was in sight and the shark continued until the spool was empty except for the knotted end. Then the 60 lbs line began to stretch – and stretch – until the fight became a simple tug-o-war between the slowly swimming shark heading for the Aran Islands and Jack and Gerrard braced on the rocks of Green Island. The shark won. It ended with a ‘ping’ when the 60 lbs line broke at the reel. Jack sat down and stared at his rod and empty reel. It was the first and only time I ever saw jack Shine perplexed. As a young boy fishing for mackrel at the green island and talking to Jack he was a true gentleman an always had time to answer boys questions and i had the privelige of watching him catching shark.